Tech Shuttles lining up on 24th Street in Noe Valley. Monday, October 29, 1:30 PM – cancelled twice! Who will get to drive in the Red Lanes? SFMTA Director Ed Reiskin, is handing the decision on whether or not private tech buses will use the Red Lanes to the Supervisors. Don’t miss your chance to comment on who can use the Red Lanes. The attorneys for the plaintiffs in the commuter shuttle case have decided not to appeal the adoption of the permanent commuter shuttle program on February 21, 2017. 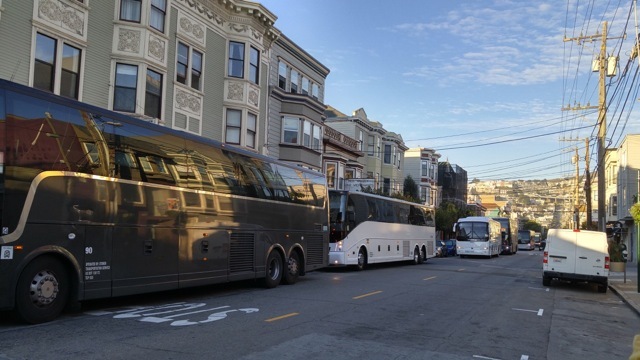 On that day, SFMTA Board of Directors voted yet one more time not to enforce California Vehicle Code 22500, which prohibits the operation of private carriers (in this case, the tech shuttle buses) in public bus stops. This is disappointing, as we all want to preserve public space (public bus stops) for public activities (public transportation). However, the lawyers thought the obstacles could not be overcome. Plaintiffs filed suit against the City in May 2014 for the adoption of the 18 month pilot program, which started in August 2014. The basis of the case at that time was both the absence of an EIR and the violation of California Vehicle Code 22500 (i). The City Attorney — and lawyers for real parties in interest, Google, Genentech, and Apple — filed motion after motion to delay the trial. The judge let them get away with virtually every motion (but not the one in which they challenged the standing of the plaintiffs). In the meantime, in December 2014 a Republican Assembly member from Southern California introduced legislation at the state level to amend the California Vehicle Code, AB 61. This legislation was never heard in committee, and in January 2016, he introduced two other identical pieces of legislation, with the exception that both were urgency measures and that one could have been passed in an extraordinary session, AB 1641 and AB 25. Neither of those were ever heard in committee either. The trial was finally held on November 13, 2015. Judge Garrett Wong indicated he agreed with plaintiffs on the vehicle code issue, and was supposed to have issued a ruling within 90 days of the trial. The pilot program was ending on January 31, 2016, but plaintiffs were able to delay the adoption of a permanent program until deals were negotiated that included: a limit to 125 stops (but no limits on the number of shuttles that could operate in those stops), a study of hub option, an agreement to do air quality tests when the number of private carriers at any one stop doubled, and a housing impact study. The plaintiffs gave up the California Environmental Quality Act part of their suit in exchange for these agreements, with the intention of pursuing the vehicle code violation in court. However, Wong let the 90 days pass and waited until after the adoption of the one-year “permanent” program in March 2016 to issue a ruling. At the end of April 2016, his ruling dismissed the case as moot because the pilot had ended. The case is No. CPF-14-513-627. You can read the case history here. In the meantime, the SFMTA Board of Directors adopted another permanant program on February 21, 2017, this time without any time limits and without conducting a housing study. The new legal basis for the shuttle program has become “parking regulation.” You can see the documents related to the action on February 21 here. There is also no environmental designation for the permanent program because the City has determined that the shuttle program is not a “project.” The City determines that certain programs are not “projects” — and therefore don’t rise to the level of environmental review (a categorical exemption, a negative declaration, or a full environmental impact report) — when it’s trying to avoid public oversight and possible legal challenges. For example, the Super Bowl 50 event at the foot of Market Street was deemed not a project — no way for any member of the public to challenge it based on CEQA. Some of us are still pursuing other avenues. We have recently realized that Proposition 26, passed in 2010, permits local governments to charge more than cost-recovery fees in certain circumstances. Proposition 26 permits local governments to charge more than cost recovery, for voluntary programs and for programs that utilize public infrastructure. The shuttle program is voluntary and curbs are public infrastructure. I continue to check the state legislature every few days to make sure no one has introduced legislation to amend the vehicle code. So far this year, no one has. However, someone could introduce language to amend the vehicle code into another bill at any time through the gut and amend process. I’m sorry to give you this news, but hope that some of you out there are still interesting in working on freeing up our public bus stops for public buses. Our public transportation system is part of our armor against income inequality and climate change. We won’t be able to expand our public transportation system if our public buses are competing for curb space with private, exclusive, luxury carriers. There is no longer a CEQA cause of action for moving forward on this matter legally, but the vehicle code violation remains. If anyone is interested in hiring lawyers to move forward with this cause of action, it is my understanding that there are a few years to do so. Thank you to all of you who have supported this effort.